You have neither set up a featured image, nor uploaded any slider images. Please fix this in your post. Otherwise, use the No Image layout, which does not require any image. Mindfulness in general, and meditation practice in particular, serves to more firmly ground one in present-moment experience apart from thought-driven notions of how things need to be different than how they are in order to be “happy.” It is the very thought that things can be any different than they are in reality that is misguided and at the root of much suffering and unhappiness. A similarly misguided expectation, however, is that dedicated mindfulness practice can successfully insulate us from any existential pain that appears inherent in the human condition. Sickness, aging, and death may lie at one end of the spectrum, while more innocuous conditions such as boredom may lie at another end. These conditions are inevitable; but the thought-driven notions of how these conditions should not exist in the first place are illusory and are what precipitate suffering on top of the inevitable challenges of reality. Legal issues seem to trigger a range of painful experience. As with most experiences that lead to suffering, fear is often the underlying antecedent of the suffering. In most cases, however, this fear arises out of a thought-driven layer imposed on a condition existing in reality. The challenge, both for attorneys and clients embroiled in conflict, is to remain open to and accepting of the actual situation in realty without becoming hooked by conditioned thought and/or judgements about the situation. The ability to remain grounded in our experience without becoming hooked by our intellectual processing of that experience lies at the heart of mindfulness practice, and is critical for clients and attorneys trying to successfully navigate challenging life situations. In the throes of legal issues or conflict, the cultivation of this ability, or lack thereof, will largely determine one’s ability to identify optimal solutions to often complicated issues. To the extent that one has become hijacked by his or her thoughts in response to a given scenario, behaviors and decisions are likely to become oriented towards allaying some subconscious fear, usually related to one’s ego. Because of the largely illusory roots of such fears, decisions and behaviors based on motivations springing from these roots will prove largely unsatisfactory, and produce less than optimal solutions for all directly or indirectly impacted by the way in which the conflict is ultimately resolved. Thus, the ability to identify and implement optimal behaviors in response to everyday life situations in general, and legal issues or conflict in particular, is critical for happiness and demands a high degree of consciousness cultivated through sustained mindfulness practice. More often than not, when a client comes to an attorney for advice or representation, he or she is at least partially ensnared by underlying conditioning and disconnected from present-moment reality (i.e., the reality is that he or she is caught in learned conditioning or fear, which are real, but usually not based in present-moment reality). The goal of holistic law practice is to first help the client identify this conditioning so that he or she can then consciously disidentify from that conditioning and more meaningfully connect with what is really going on. In so doing, the client becomes far more able to let go of unwarranted fear and become, in general, less reactive to the situation. In becoming less reactive, he or she begins to open to a far more broad range of approaches to potentially resolve the conflict. To learn more about the benefits of holistic law practice as a client, contact Holistic Lawyer Mike Lubofsky at (415) 508-6263, or visit http://www.Holistic-Lawyer.com. If you are an attorney interested in how to integrate mindfulness in law practice, visit http://www.mindfulaw.com. 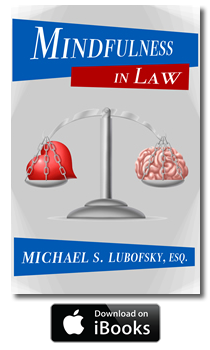 In 2017, Mike Lubofsky, Founder of the Holistic Lawyer Association, published "Mindfulness in Law" which is now available for free download in Apple's iBooks Store.